The Mandalay, located in Mandalay, Myanmar, is the last royal palace of the last Burmese monarchy. The palace was constructed, between 1857 and 1859 as part of King Mindon's founding of the new royal capital city of Mandalay. The plan of Mandalay Palace largely follows the traditional Burmese palace design, inside a walled fort surrounded by a moat. The palace itself is at the centre of the citadel and faces east. All buildings of the palace are of one storey in height. The number of spires above a building indicated the importance of the area below. Mandalay Palace was the primary royal residence of King Mindon and King Thibaw, the last two kings of the country. The complex ceased to be a royal residence and seat of government on 28 November 1885 when, during the Third Anglo-Burmese War, troops of the Burma Field Force entered the palace and captured the royal family. The British turned the palace compound into Fort Dufferin, named after the then viceroy of India. Throughout the British colonial era, the palace was seen by the Burmese as the primary symbol sovereignty and identity. Much of the palace compound was destroyed during World War II by allied bombing; only the royal mint and the watch tower survived. A replica of the palace was rebuilt in the 1990s with some modern materials. 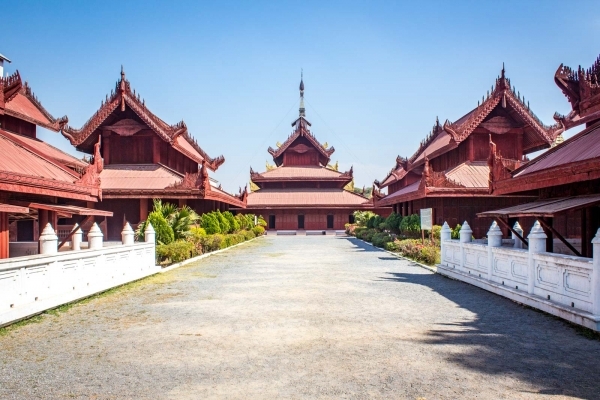 Today, Mandalay Palace is a primary symbol of Mandalay and a major tourist destination.